To many, the large-format SSL mixer represents the very quintessence of the recording console. But although still a very important part of SSL's business, the market for such consoles has changed — the majority are probably now sold to educational institutions and very well-heeled personal studios, rather than commercial music facilities. Smaller project studios now drive much higher volumes of pro-audio gear sales, of course, and these typically have very different requirements. SSL have catered for this market for quite some time, with several more affordable, compact, but very high-quality mixers and outboard designed for contemporary DAW-based workflows. More recently, however, SSL embarked in an interesting new direction, with their impressive Fusion Stereo Analogue Processor (reviewed in SOS December 2018). This was a novel product for SSL, not only because it introduced new functionality and addressed new applications, but also because it was the first to be manufactured wholly in China. Most of SSL's product lines are built from sub-assemblies manufactured in Britain but, since SSL's acquisition by the Audiotonix group (in which SSL now sit alongside Allen & Heath, Calrec, DiGiGrid, DiGiCo and Klang:technologies) the company have had access to a very high-quality manufacturing facility in China. As a result, SSL are now developing a range of products that wouldn't have been viable if built with their established manufacturing techniques. This promises to bring some seriously high-quality gear within reach of project-studio users. The Fusion has already proved very successful, and now SSL have embarked on their second overseas adventure: the new SiX console. Apparently, the SiX (so named due to its input channel count) was conceived a couple of years ago, but initial build costs meant it was forecast to retail at over £2000 (about $2500), which was thought to make it commercially unviable. Building it in China has allowed a much lower manufacturing cost without sacrificing component or build quality so, after a year in production development, the SiX is now a welcome reality. The design is classic SSL, with ultra-clean 'SuperAnalogue' circuitry throughout, mostly derived directly from existing SSL consoles. DC servos are used to manage inter-stage coupling, so there are no electrolytic capacitors in the signal path, and the SiX's high-end performance is clear from its impressive technical specifications — which I confirmed though tests with an Audio Precision analyser. For example, the maximum output level is +27.5dBu, and the worst-case noise floor (ie. with all channels routed to the mix bus) is better than -85dBu, giving a dynamic range of around 112dB. With just a single channel routed to the output (such as when recording a single vocal mic) the noise floor is better than -90dBu, giving a dynamic range of more than 117dB. The THD+N figure is equally impressive, at 0.0015 percent, and the console's -3dB bandwidth extends from 4Hz to well over 80kHz, which should ensure precise transient and time-domain behaviour with minimal in-band phase-shifts. So there's clearly been no corner-cutting here — the SiX delivers genuinely superlative, professional, high-end performance. 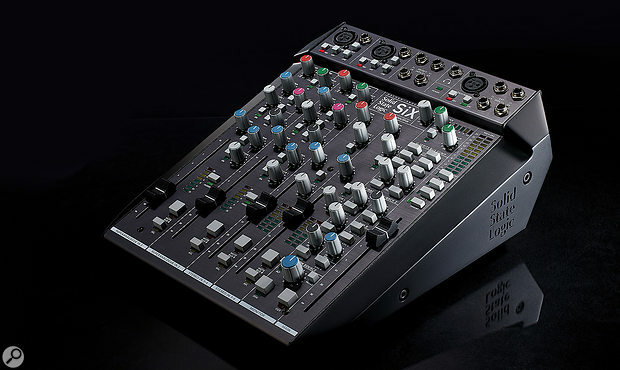 Opening the smart Apple-esque shipping carton reveals a mini-console that resembles other compact desktop mixers, but even at first glance there's a distinct air of purposeful professionalism and quality here, with five long-throw faders and a generous sprinkling of knobs and buttons, all in SSL's familiar style. The SiX is wedge-shaped and half rack-width (kits are available for rackmounting a single SiX, or two of them arranged side-by-side), with two mono mic/line and two stereo line input channels to deliver the six inputs — but there's much more to this little mixer than that! The SiX features several channels of compression, including two one-knob channel compressors, a 4:1‑ratio stereo bus compressor, and a listen-mic compressor for the talkback input — which, incidentally, can be used with a little creative routing as another mic input channel at mixdown. The headline features start with the two mono mic/line channels, which both also have DI capability, one-knob compressors, two-band EQs, balanced insert points (the sends doubling as direct recording outputs), and two stereo cue sends. Alongside are two stereo line channels. While these also have access to both cue sends, they lack the EQ, compressors and inserts. Two external stereo line inputs are also provided and are routable into the main mix bus A, the foldback outputs or the monitor bus. In addition to the stereo mix bus A there's an alternate stereo mix bus B, a simple but capable monitoring section with main and alt speaker feeds, and talkback (complete with SSL's infamous Listen Mic Compressor, or 'LMC') to the two stereo foldback outputs. In total, this mini-SSL can accommodate 12 inputs for analogue summing, and there is even a simplified G-series bus compressor for a bit of 'mix glue', plus balanced inserts on the mix bus A path. Most of the physical inputs are, conveniently, on the top panel, while the outputs, inserts and ancillaries are accessed from a recessed panel at the rear. The mixer is powered from an external universal 'line-lump' PSU, and is convection-cooled through vents under the front and at the rear. In use, it gets noticeably warm, with the top of the rear panel reaching a toasty 41 degrees Celsius after a few hours. SSL's design team have clearly tried to make the SiX as flexible and versatile as possible for the widest imaginable range of applications. They see these as including tracking and analogue summing in project studios, small location recording sessions, general mixing and monitoring duties for small-scale audio-for-video post-production, voiceover, podcasting and broadcast/streaming facilities, and even on-stage source mixing and monitoring for musicians in live-sound applications. 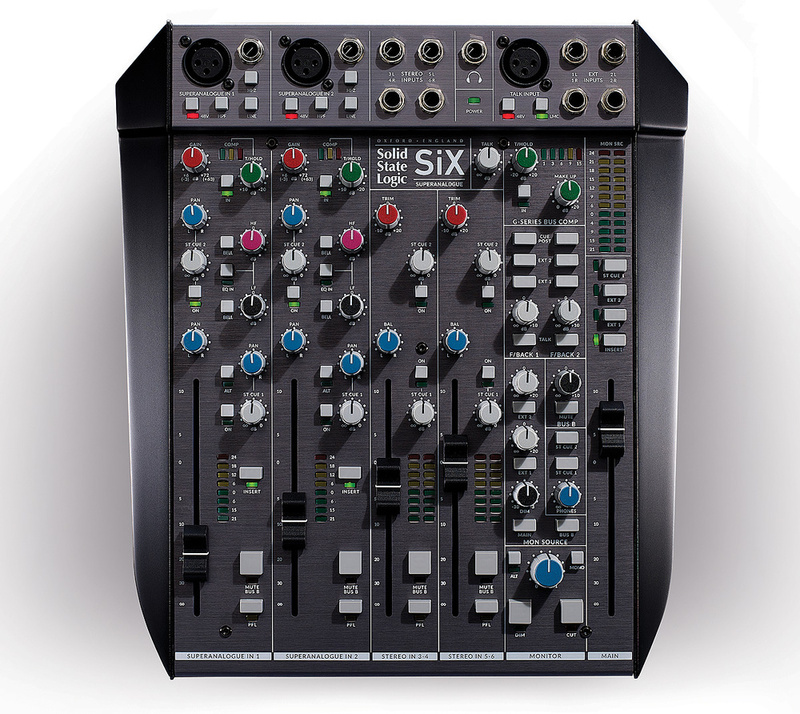 For me, an obvious elephant in the room is the SiX's lack of direct computer interfacing — the SiX is 'just' an analogue mixer. That will doubtless disappoint some potential customers, and could limit its market in the face of properly integrated preamp/DAW interface/monitor-controller products from the likes of Apogee, Audient, Focusrite, UA, and some less high-end small mixers. On the upside, though, I can't think of any other compact desktop mixer that matches the SiX's sound quality and feature set, let alone its gorgeous styling. And who knows? A combined mixer/interface combo is well within SSL's capabilities for the future... A SiX-Extra perhaps? Meanwhile, you'll need an audio interface that has at least a stereo input and output if you want to hook this mixer up to your DAW software. A mixer's functionality can usually be inferred from its connectivity, and that starts at the rear of the SiX in a recessed vertical panel. Located here are the main stereo mix bus A outputs on XLRs, with mix bus B's outputs on quarter-inch TRS sockets. All are electronically balanced — there are no audio I/O transformers in the SiX. Two more pairs of TRS sockets provide the balanced main and alt monitoring outputs, while another two pairs deliver the two balanced stereo foldback outputs. For the uninitiated in 'SSL-speak' I'll explain, so that we're all clear on the terminology, that what you may think of as the channels' aux sends are called 'cue sends' here. These cue sends don't actually have dedicated outputs of their own, but become a selectable source for the artist foldback outputs, which would normally be used to feed the performers' headphone amplifiers or stage monitors. And in case you were wondering, these foldback outputs can, of course, also be used for effects sends or clean feeds (mix-minus) and so forth, if required. The external line-lump power supply connects using a five-pin XLR — an interesting choice, since only two of the pins are actually needed — and delivers 15V DC at 3.3A (which is why the console runs slightly warm). DC-to-DC converters inside the mixer generate all the required symmetrical power rails and phantom voltages. 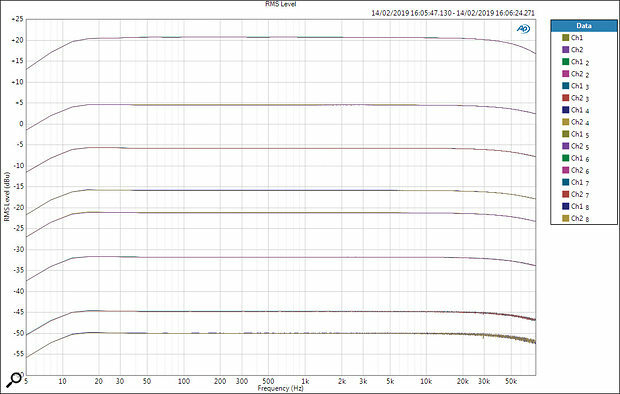 The screen terminals of the audio connectors are grounded directly (less than 0.5Ω) to the safety earth connection at the PSU's IEC mains inlet, and a spectral analysis of the mixer's residual noise floor showed it to be very clean, with a few (mostly mains-related) spikes all below -120dBu. An on/off button is tucked away immediately above the XLR but doesn't isolate the PSU from the mains supply, obviously. The rear panel plays host to the various analogue outputs as well as the inlet for the external DC power supply. Various other I/O connections are accessed through a pair of 25-pin D-sub sockets wired to the familiar AES59 (Tascam) standard. The output socket carries insert sends for stereo mix bus A as well as the two mono input channels (the latter being usable as direct record feeds). There are also (parallel-wired) duplicates of both the mix bus A and main monitor outputs, which could be useful for feeding hardware meters, perhaps. The input D-sub connector receives insert returns for mix bus A and the two mono channels, and also accepts 'alternative' (mono) line inputs, which are selectable sources for the two mono channels' stereo cue sends (see below). If you've been counting, you'll realise that this particular input socket has two unused channels — and I was surprised that SSL haven't seen fit to make constructive use of them, since several practical opportunities spring to mind. 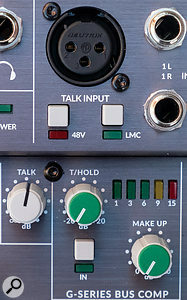 For example, direct I/O access to the talkback section's LMC compressor might have been nice, or a dedicated stereo PFL output for external monitoring (always handy in a broadcast/post-production application), or even duplicating the mix bus B outputs to make it easier to sum bus B into bus A for clean-feed (mix-minus) applications. Of course, these potential ideas would break the convention of all analogue AES59 channels operating in the same direction... but rules are made to be broken after all, and it wouldn't be for the first time! 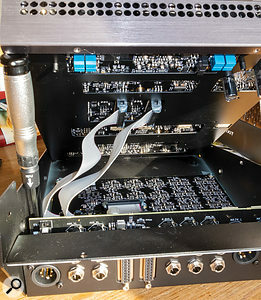 Moving to the front panel's connectivity, the two mono channels are each provided with an XLR for the mic input and a quarter-inch TRS socket for the line/high-impedance DI input; individual phantom power and the appropriate input type are selected on adjacent buttons. The two stereo channels are equipped with pairs of TRS sockets, cross-normalled to ensure that a single left‑channel input automatically appears as a dual-mono signal in the centre of the stereo image. Two more pairs of TRS sockets accept the two external stereo line inputs, with independent level controls located in the master section. Surprisingly, there's no internal talkback mic, but a third XLR on the top panel (with independently switched phantom power) accepts an external talkback microphone signal, and it's positioned perfectly for a gooseneck-type mic to plug straight in. There's also a conventional quarter-inch stereo (unbalanced) 'engineer's headphone' output socket here, too. Working through the signal paths, the mono channels adopt the familiar practice of padding down the line input when selected (by a nominal 9dB in this case) and routing it through the mic preamp. The gain range for the mic input is marked +6 to +72 dB. My bench tests revealed the range to be 0 to +71 dB, but this was measured from the input to the main output, with the faders at zero and the pan-pot in the centre position — the range would be offset 4.5dB higher with a hard pan, or if measured at the insert send. Although there's no input pad, the maximum mic input level is a very healthy +20dBu before things start to sound edgy, and the incremental gain spread around the control's rotation is relatively uniform. I noticed a slight 'gain rush' at the clockwise end but it was barely perceptible compared with so many budget preamps and it wasn't a problem in practice at all. Bench tests revealed that the line input is actually padded down by 8dB, so that the gain control then ranges from -7 to +61 dB, and that applies to the DI mode, too, which simply raises the input impedance of the line socket from 10kΩ to 1MΩ (the mic input presents the traditional 1.2kΩ). Another button activates a second-order (12dB/octave) high-pass filter with a corner frequency of 75Hz, but there is no polarity reverse option, sadly. At maximum preamp gain, the residual noise floor from the mic preamp measured -55.5dBu, so the EIN figure comes out just under -127dBu, which is very good. A bypassable two-band EQ comes next. Each band offers standard ±15dB low- and high-shelf equalisation, with the corner frequencies at 60Hz and 3.5kHz, respectively. However, each band can be switched separately into a bell mode, for which the centre frequencies are 200Hz and 5kHz. This ingenious arrangement provides considerable versatility, and I found the options to be very effective in real-world applications. Following the equaliser is a bypassable 'one-knob' compressor, which, though inspired by the channel compressors of SSL's large-format consoles, is actually an entirely new design. Equipped with a 'traffic-light' gain-reduction meter, the single threshold knob spans a range of +10 to -20 dBu to determine how much 'squash' is required, while the release time and ratio are fixed at benign settings of 300ms and a hard-knee 2:1. The attack time, though, is programme-dependent and varies between 8 and 30 ms, which is fast enough to exert reasonable control over the dynamics without being overly aggressive. An automatic gain make-up system preserves the output level, adding up to 10dB of boost for the lowest threshold setting. 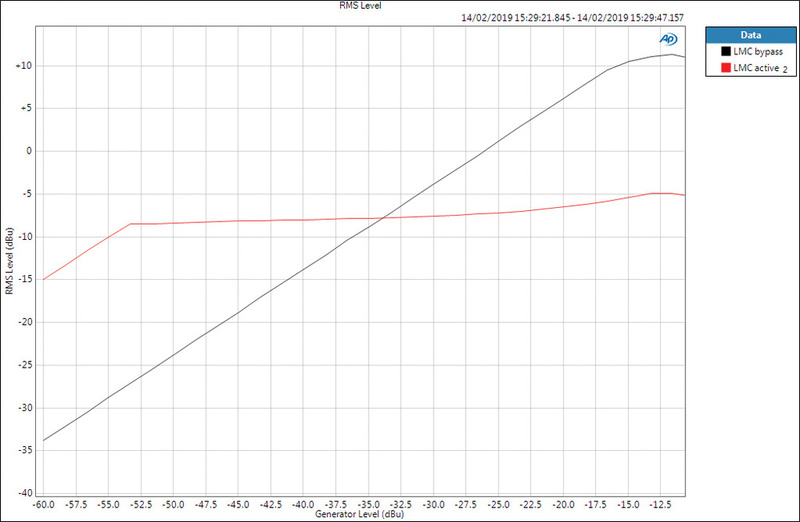 Next comes the balanced insert point (post-EQ/post-compressor) and the send is always active, as already mentioned. Since the high-pass filter, EQ, and compressor can all be fully bypassed, the insert send can deliver the preamp's direct output, if required, for ultra-clean direct-record tracking. The balanced return is selected by a button alongside the channel fader, and the post-insert/pre-fade signal is displayed on an eight-segment bar-graph peak meter scaled from -21 to +24 dBu. The fader is configured with 10dB of gain above the unity position, and the channel pan pot applies 4.5dB attenuation at the centre (relative to each end). By default, the panned channel output is routed to the main stereo mix bus A. A large button near the bottom of the fader routes it instead to mix bus B, if desired, but also serves as a channel mute if mix bus B is not being used. A smaller, latching button activates PFL (with a yellow status LED). The two stereo line channels are much simpler affairs, offering just a level trim control (-10 to +20 dB) at the top of the strip, a stereo bar-graph peak meter alongside the stereo fader, the bus B/mute and (stereo) PFL buttons, and a balance control instead of pan. I previously mentioned the two stereo cues, which can be accessed from all four input channels, with individual level controls and 'on' buttons. The two mono channels also feature pan controls for each cue send, and 'Alt' buttons for cue 1, which replace the channel's signal with that alternative external line input arriving through the D-sub connector. The cue sends are all normally derived post-insert but pre-fader, but they can be changed to post-fader using buttons in the foldback master section, which reconfigure all cue 1 and/or all cue 2 sends globally. The stereo mix bus A output fader (with 10dB of gain above the zero mark) is on the right-hand side of the console. Immediately above is a group of four buttons with status LEDs, the first of which activates the mix bus A insert return. The others enable the additional summing bus contributors: External 1, External 2 and, rather unusually, the stereo cue 1 bus (so that those alternative mono external inputs described above can be employed in the mix). 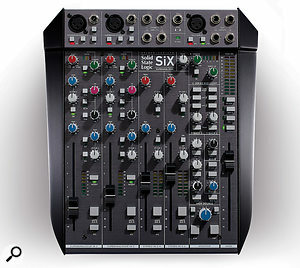 Despite the smaller size, the SiX looks and feels like a 'real' SSL, and the familiar coloured knob caps aid navigation of the (inevitably slightly crowded) controls.As a result, mix bus A sums two mono input channels, four more from the two stereo line input channels, another four from the two External stereo inputs, and yet another pair by way of the mono channels' cue 1 external inputs. That makes 12 summing inputs in total (10 line and two mic/DI/line), which is quite an impressive feat for such a compact device. This feature also works for bringing stereo effects returns into the master stereo mix, or for cascading an expansion mixer, of course. Mix bus A's signal path is quite simple, with the mix bus summing amplifiers driving the master insert send, and then the bypassable return feeding into a (simplified) G-series bus-compressor ahead of the main stereo output fader and output drivers. 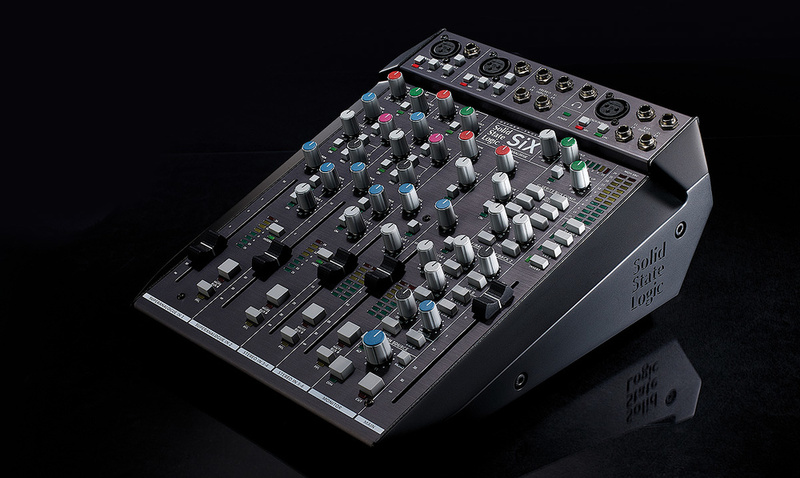 Mix bus B is even simpler, with the mix bus summing amps driving a rotary fader (with mute button) before the output appears at the rear‑panel connectors. If you were wondering (because they're not entirely obvious at a glance), the mix B rotary fader and mute button can be found nestling amongst the profusion of knobs and buttons in the monitoring section, alongside the main output fader. Interestingly, while the stereo bus compressor is based directly on the classic and much-loved G-series design, it has been simplified and uses a more modern VCA chip here (although the SSL gurus assure me it sounds exactly the same!). Its three controls are located at the top of the desk, alongside the output metering, and comprise threshold (-20 to +20 dB), gain make-up (0 to +20 dB), and an 'In' button. There's also a five-segment gain-reduction meter (0-15 dB). The attack and release times are fixed, as is the very soft-knee 4:1 compression ratio — settings which I'm told were chosen to reflect those most commonly used on the big studio consoles. The monitor section is reasonably versatile, with mix bus A, mix bus B (both post-fade/post-mute), External 1 and External 2 (post-level controls) all available as sources which can be auditioned individually or in mixed combinations. There's one potential 'gotcha' to watch out for, though: with no source selected there's no monitoring output at all, and it's not entirely obvious if the buttons are depressed or not! I was also surprised to find no way to monitor the foldback outputs to check what the artists are hearing, though the two stereo cue sends can be auditioned on the headphone output. A large, 11-segment bar-graph meter displays the monitored signal and is scaled from -21 to +24 dBu, with greater resolution above the 0dBu mark than the input meters. Dedicated segments for +15, +18 and +24 dBu make alignment with standard DIN, EBU and SMPTE A-D converters very straightforward. Input channel PFLs always override the selected monitoring source(s) when activated, and there's also a mono button (introducing -3dB attenuation of the summed stereo signal), monitor mute, and output routing to either the main or alt speakers. Frustratingly, while SSL have seen fit to provide an adjustable -3 to -30 dB dim facility, they've not included a right-channel polarity reverse button, so it's impossible to check the stereo difference signal (something I find essential!). A single rotary level control, which is the largest knob on the console, sets the listening level for the main and alt outputs, and the engineer's headphones have a separate volume control. Normally, the headphone output carries the selected monitoring signal (including the PFL override), which is derived after the mono button but unaffected by the dim, mute and monitor level controls. The headphones can also audition the cue 1 or cue 2 mixes (as opposed to foldback 1/2), if desired, which is useful if an artist is working in the control room. More usually, performers would use the mixer's two stereo foldback outputs for their studio headphone amp, and each foldback output has its own rotary master level control. Logically enough, foldback 1 carries the cue 1 signal, and foldback 2 the cue 2 signal, but these can be replaced individually with either of the two External inputs or with talkback (all using separate latching buttons). I was surprised that there are no LEDs to warn when talkback is active, particularly since the buttons are mechanically latched types. However, this latching arrangement does enable the talkback signal path to be used as a third mic input by routing the relevant foldback output back into an input. This makes it practical, for example, to record a drum kit, with kick and snare mics through the two mono channels and an overhead/room mic via another line channel (and squashed through the LMC if desired). The SSL boffins have done a very good job with the console ergonomics on the whole, especially given this mixer's very small footprint and generous feature set.The panel layout is inevitably quite 'busy', though, and I found I had to look carefully to find the function I wanted even after using the desk for a week. Thankfully, there are status LEDs almost everywhere that matters, and coloured knob caps help to identify the different features (although the adjacent proximity of channel and cue 1 pans on the mono channels often confused me). The monitoring section requires careful use, too, and some print shading under the monitor section controls might help to separate them visually from unrelated functions. I've used a screwdriver to prop the top of the mixer open, revealing the high quality PCBs and the steel case enclosing the upper section's electronics. There's a lot of metalwork in here which accounts for its strength and ruggedness.Internally, the SiX uses surface-mount components almost universally, as you'd expect, but the standard of construction is everything you'd hope and desire of an SSL product; it really is outstanding. 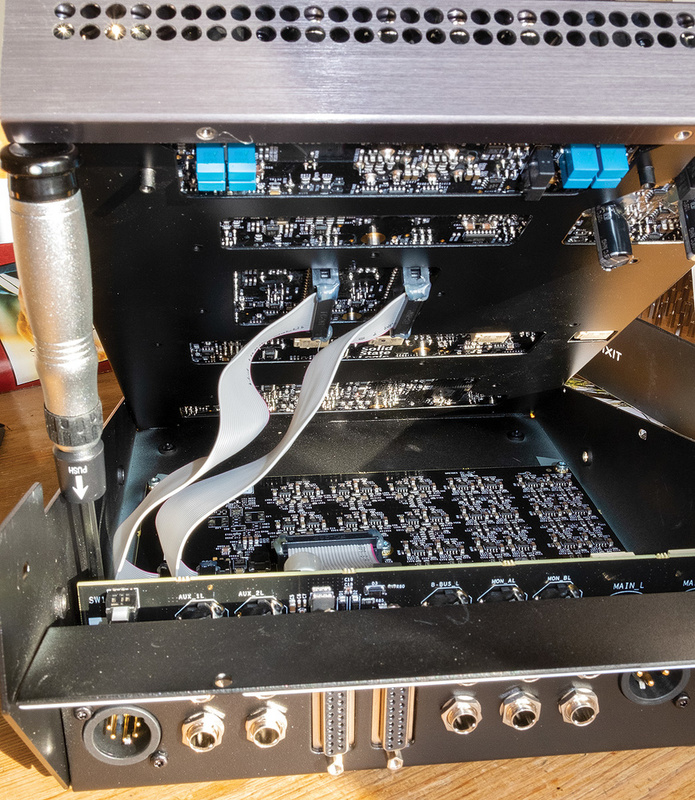 The lower panel I/O connects to a very high-quality PCB on the base of the unit carrying the balanced receiver and driver circuitry, and that is linked via a couple of ribbon cables to a second PCB suspended under the front‑panel controls. This board is enclosed within its own steel casework, which provides additional screening and mechanical support. Servicing might not be terribly easy, but it's certainly a solidly built piece of kit which oozes quality, ruggedness and longevity wherever you look! Although there are a few surprising and potentially disappointing omissions (the lack of input polarity reverse buttons, a stereo-difference monitoring facility, active talkback status LEDs, and foldback AFLs), I have to say that this is a lovely little console which performs as well, and is as nice to use, as any of its much larger siblings. It really is a remarkably versatile and capable little mixer which slots in very elegantly alongside the X-Desk and XL-Desk in SSL's range. It would seem logical to assume a larger version will follow in due course, now that SSL have access to more cost-efficient manufacturing, but to my mind, much more appealing to many prospective users would be a version featuring an integrated audio interface. Who wouldn't want an affordable SSL console providing the front and back ends of their DAW-based studio setup? Sound wise, the SiX's performance is exemplary. Headroom margins are generous, noise and distortion are as low as best practice allows, and the bandwidth is huge — all of which means this desk sounds completely transparent. And yet, the one-knob compressors and EQ on the mono input channels can be used creatively to shape sources when necessary, and the stereo bus compressor does exactly what is needed to glue a mix together. It's impossible for me not to fall in love with this sweet but extremely capable little console, and think up countless applications and justifications for purchasing one — and plenty of people will feel the same! 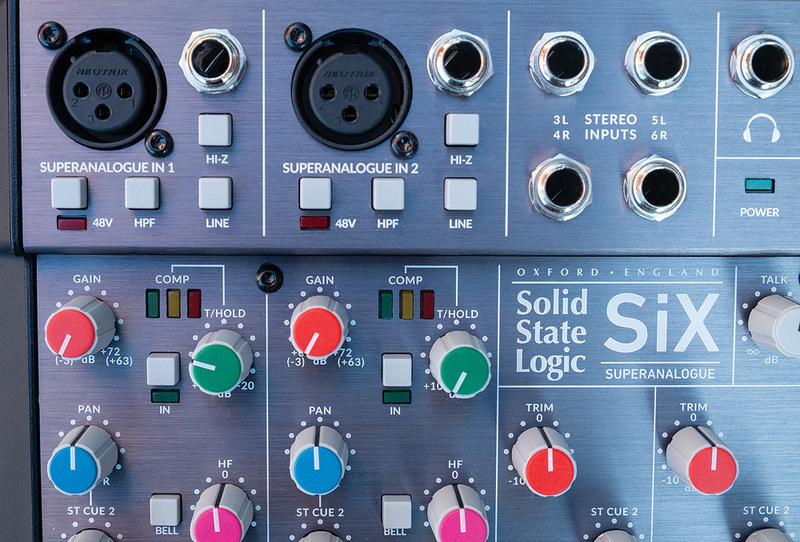 Small desktop mixers may not be uncommon, but there is no other that is so compact, yet so well-equipped and versatile as the SSL SiX — and certainly nothing of this size that can match its technical performance. The crosstalk between left and right channels of the stereo line input, measured with respect to frequency. 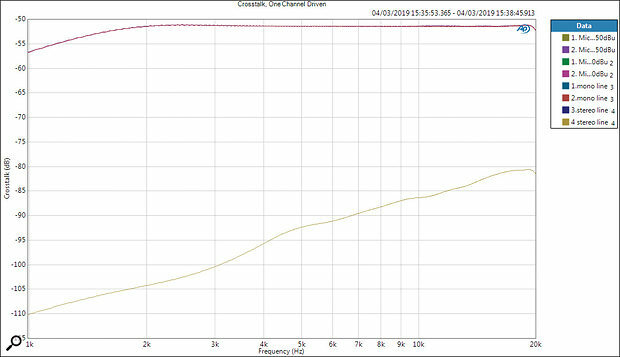 The lower trace was measured at the main outputs from a stereo line input channel, and follows the expected rise at higher frequencies while remaining below -80dB even at 20kHz, which is excellent. 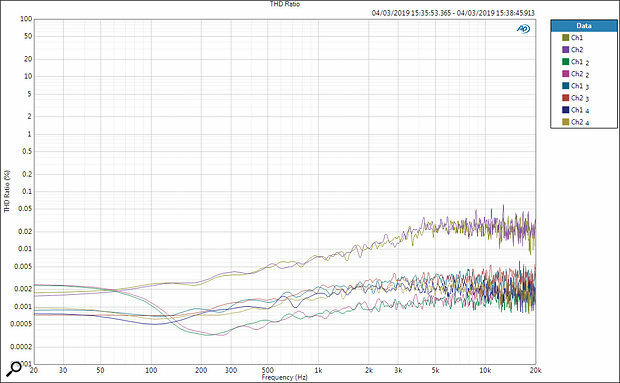 The upper traces were obtained via the mono channels, testing the mic input at both -50dBu and 0dBu input levels. A plot showing the overall total harmonic distortion (THD) with respect to frequency measured at the main outputs. The highest traces were obtained using a -50dBu signal into the mic input with 50dB gain, and the lowest with a 0dBu signal into the mic input at 0dB gain. The middle traces were with 0dBu signals going into the mono channel line inputs and the stereo line input channels. 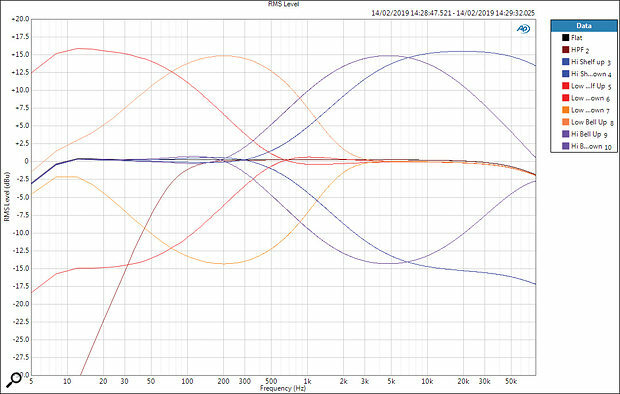 A combined plot showing the EQ settings available on the mic/line channels. 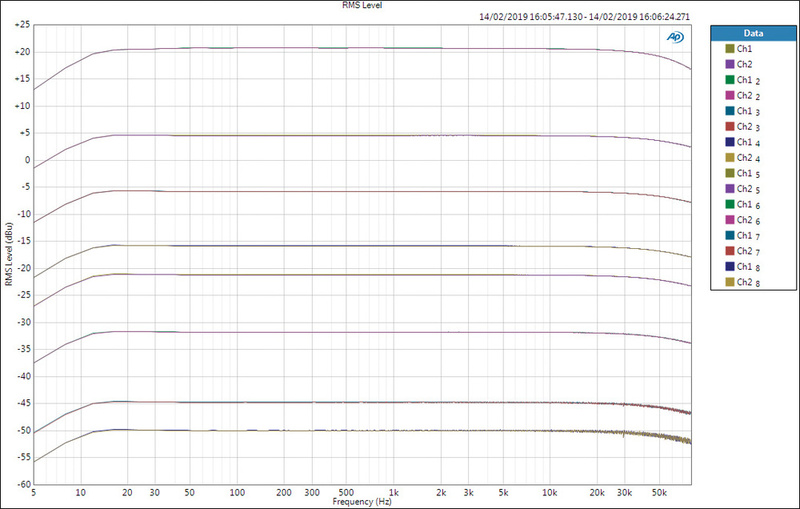 The black plot is with all EQ bypassed, revealing the -3dB bandwidth limits to be around 4Hz and well over 80kHz. 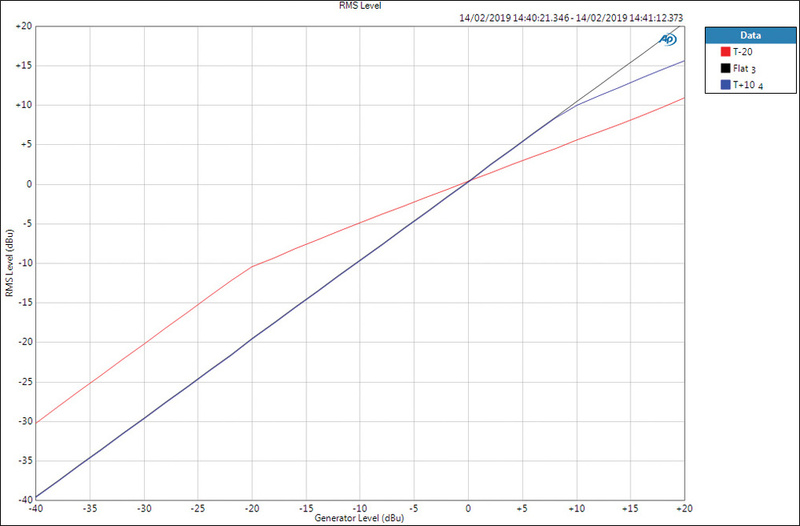 The brown trace is for the high-pass filter, red for the low-shelf with maximum boost/cut and blue for the high-shelf. 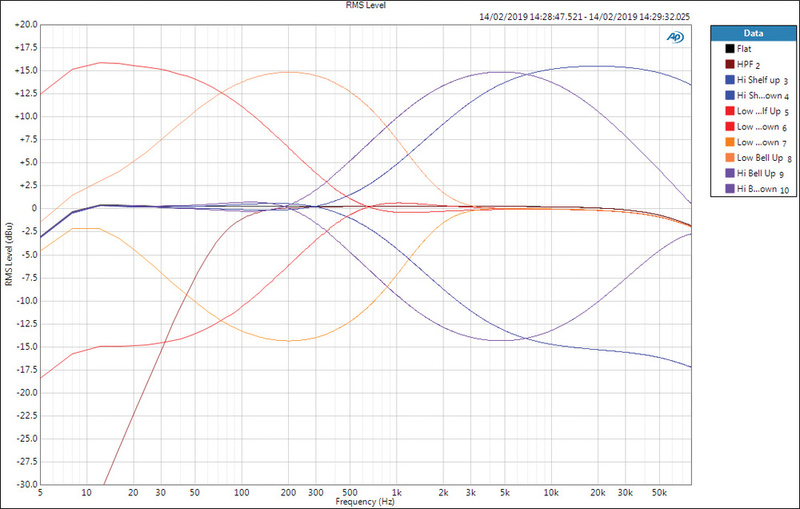 The purple and orange traces are for the two bell EQs. 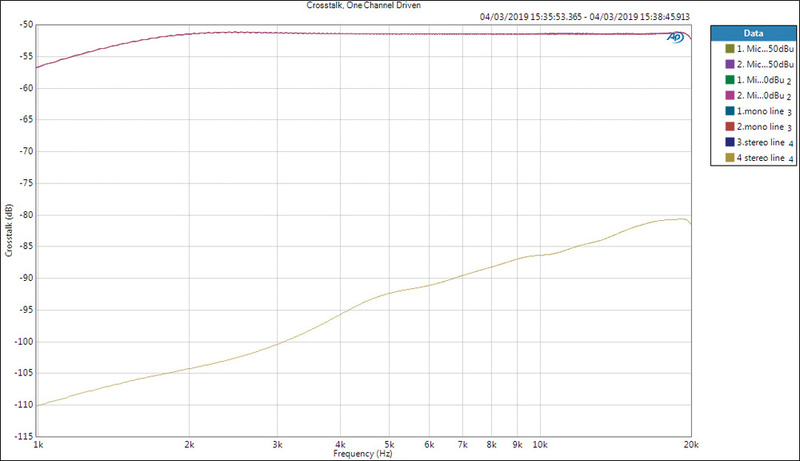 The corner and centre frequencies all tally precisely with the published specs. A frequency response plot which shows the output level from a -50dBu input as the mic preamp's gain control is advanced in equal rotary increments. 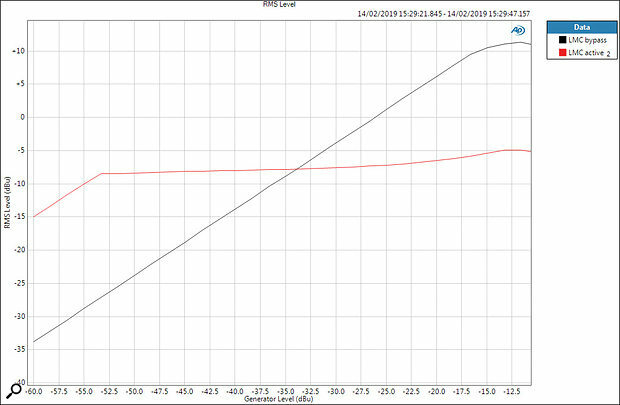 While the gain does increase slightly more quickly towards the clockwise extreme, overall the response is pleasingly linear and easily controllable. 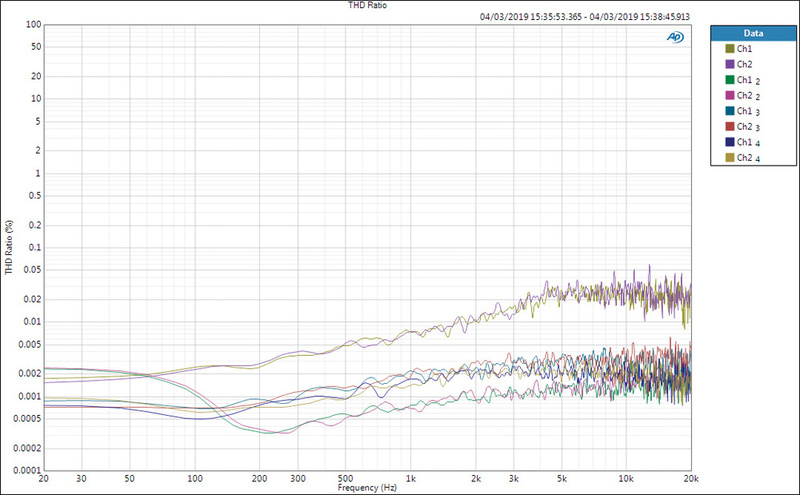 A high resolution FFT plot of the residual noise floor, revealing a few mains-related spikes, but all below -120dBu. The most affordable SSL yet! A genuine mini SSL in terms of technical performance, features and capability. Thoughtfully flexible and versatile design with masses of mic gain available. One-knob channel compressors and adaptable EQ on mic/line inputs. Effective DI inputs with plenty of gain and headroom. 12‑channel summing bus with G-series bus compressor. Talkback channel can be employed as additional mic input, complete with the listen-mic compressor. USB or digital interfacing options would have been nice. No input polarity reverse switches. The most affordable SSL ever, this is an impressively well‑built mini-console. Its well thought-out and versatile capabilities should make it very attractive indeed for a wide range of small-scale but quality-conscious applications. If paired with a decent audio interface, the SiX could double up as both a high‑quality analogue front end for your DAW and a monitor controller.